I was browsing the racks at my local Goodwill a couple weeks ago and I stumbled upon this turtleneck cape. I DO NOT do turtlenecks as a rule, but I was so intrigued by the design, I decided to overlook it. To be honest, it's a cool unique garment, but it's totally impractical. I really don't know how often I will be able to wear it due to functionality (and weather in LA). I feels a bit like a straight jacket when it's on... but man doesn't it look great with this outfit? Pshh... who needs practicality in fashion? I also pulled out this old mustard skirt from the back of my closet. I am just now realizing I have never shown this skirt on here before... That's when you know you have a problem folks. I have so many clothes I can't keep track of all of them and in 2 years there are still things you've never seen. I am the definition superfluous. On the other hand, now that I am unemployed, my shopping budget has altogether dried up. I look forward to bringing you new garments pulled from the depths of my closet! I <3 those shoes and I really like your cape and top! I seriously need to shop with you. this is a cute outfit! love it. 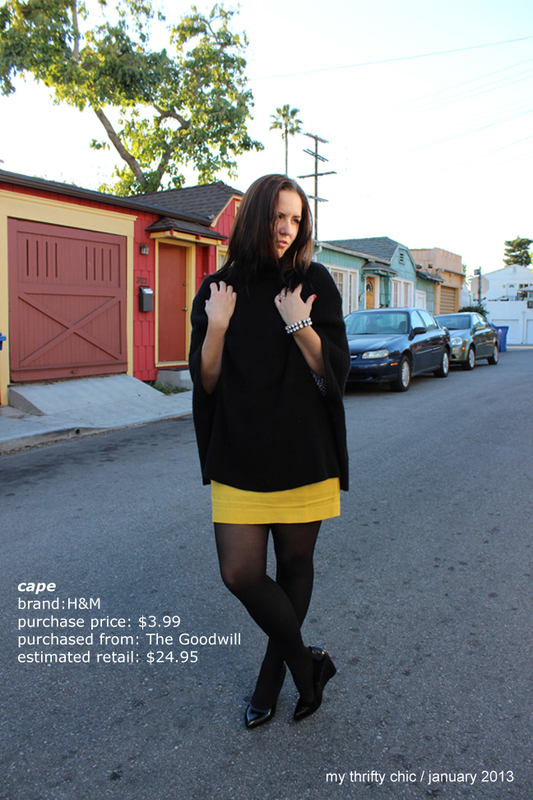 I'm not a huge fan of turtlenecks either but that cape is really chic! That necklace is gorgeous too! Awesome outfit, great pop of colour! 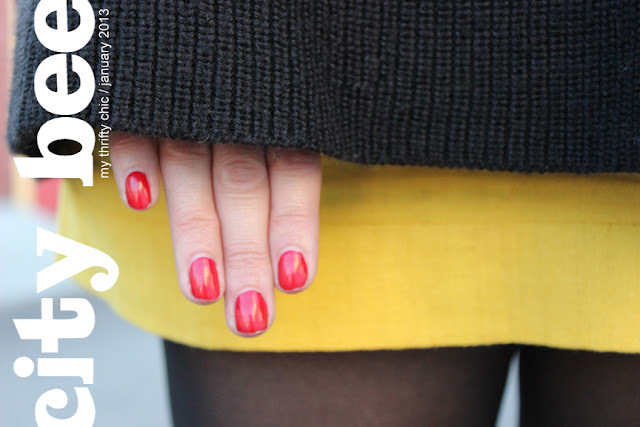 I love the mustard skirt! I need one! haha... What great thrift finds! I Love a great deal! I always shop at Marshalls or Winners. Such good finds, especially the shoes!! I have been itching to go thrifting, you have inspired me to go this weekend! I so love that skirt and adore the top! The skirt is such a wonderfully sunny shock to the outfit, love it! You're unemployed now? I think I missed that update. I have an unhealthy obsession with mustard yellow. My closet is proof. And I keep finding myself pairing it with navy and gray. cant stop, wont stop. Cute outfit! you are so fun! I love good steals and you rock it! I love the pattern in that top- it adds a great detail to the outfit! Very cute! I love the layout of your blog. You had me with the beautiful cape! We are a new mother daughter blog following you from the Pleated Poppy! What????? Oh my word, this is a total score! I love it! And paired with that mustard skirt....simply divine!!! Loving your photos!! Thanks a million for linking up! Love this look! great skirt! You look stunning, This is such a nice look! Love the yellow pop and texture differences! All too often, the most fashionable of garments are also the most impractical! What can we do but accept it? You look lovely! Fist time on your blog and can't believe everything you got thrifted...way to go girl! Stopping by from the Stylelixir link-up. I love the black and yellow combination. What a great find on that cape, pretty! SUPA cute! And I LOVE the title!! i did a yellow coat a few weeks ago with black and grey and felt a bit like a bee!! love this. I actually really like the turtleneck and the yellow skirt with the black and white is awesome. Also totally loving the new style of posts, it makes it easier to tell where you got everything!